The Sun is a ball of Iron! The sun formed instantly as a homogeneous body from an interstellar cloud with no mass accretion or mass loss. The sun formed in a timely manner by accretion of fresh supernova debris on the collapsed core of a supernova. 1. Neutrinos from the decay of fusion products in the core. 2. 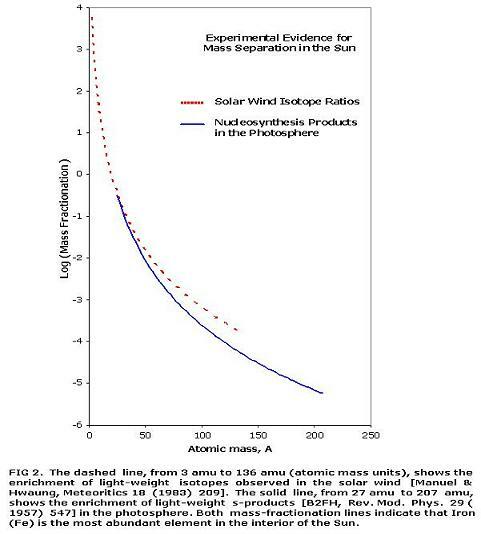 Hydrogen ions escape from the surface in the solar wind. None. Only about 0.1 % of the sun has the composition of carbonaceous chondrites. About 99% of the sun has the same composition as ordinary meteorites. 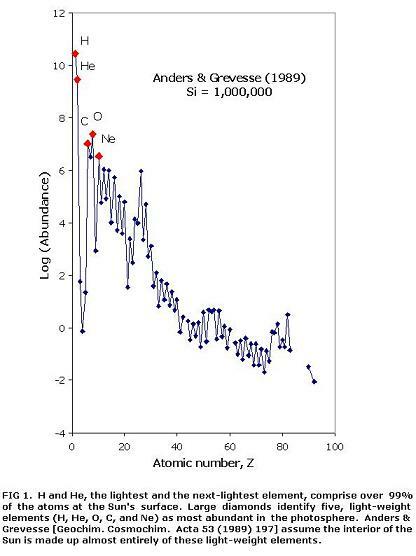 * CNO neutrinos may be indicated by growth of the solar-wind 15N/14N ratio over geologic time. "Tejonidhi lohagol, bhaaskar he gaganaraaj, divya tujhyaa tejaane jhagamagale bhuvan aaj; he dinamani vyomaraaj..."
"Red, Hot like iron, round like a fire ball. The Sun is the king of the sky. He brightens this world everyday, each day with his radiance and glory..."
Light elements are enriched at the surface of the Sun, covering it with 91% H and 9% He (the lightest and the next-lightest elements). Mass separation in the Sun is measured across isotopes of elements in the solar wind and in the abundances of elements in the photosphere. Comment from Cambridge Conference: "By choosing that target, NASA is sure to confirm that 'the solar system was made of light elements like H, He, and C' - a blatantly false conclusion." "Excess lightweight isotopes in the solar wind and lightweight s-products in the photosphere expose the mass separation process that causes these light elements to cover the Sun's surface - - - like the red peel on an apple." 2. Wind Spacecraft finds surprisingly high "Abundances of trans-iron elements in solar energetic particle events"
3. 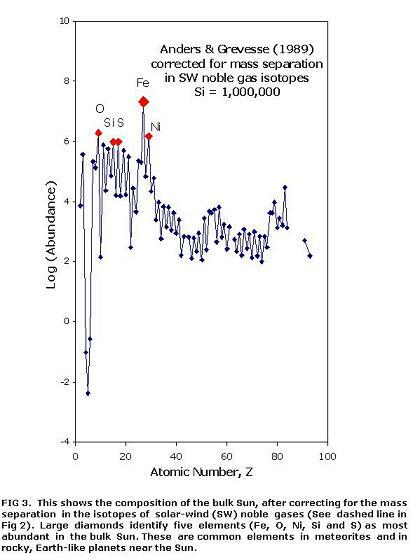 ACE Spacecraft's Ultra-Low Energy Isotope Spectrometer (ULEIS) confirms "Enrichments of trans-iron nuclei in solar energetic particles observed with ACE/ULEIS"
J. E. Mazur et al. 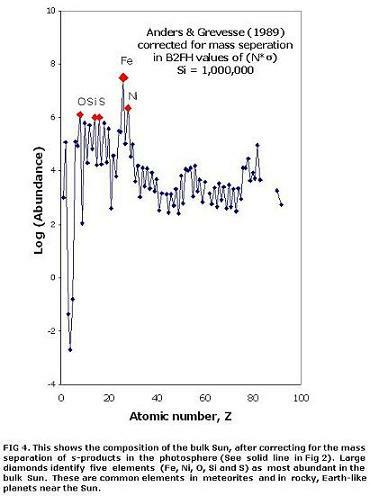 used Ultra-Low Energy Isotope Spectrometer (ULEIS) on the ACE Spacecraft to see enhanced abundances of heavy elements in impulsive solar flares. Tobias Owen et al. find excess heavy noble gases - Ar, Kr, and Xe - in Jupiter relative to those in the Sun's photosphere [Nature 402 (1999) 269-270]. The story starts, "The four giant planets in the Solar System have abundances of 'metals' (elements heavier than helium), relative to hydrogen, that are much higher than observed in the Sun." 6. The ULET sensor on the IMP-8 Satellite observed heavier elements systematically enriched in material coming from the Sun on 7 May 1974 until 17 May 1974. The AP.J. paper starts, "Overabundance of heavy nuclei is frequently observed in the composition low-energy particles accelerated at the Sun". Below are handouts (are) from a January 7, 2002 press briefing dedicated to my teacher, Professor Paul Kazuo Kuroda, in Washington DC at the 199th annual AAS meeting.